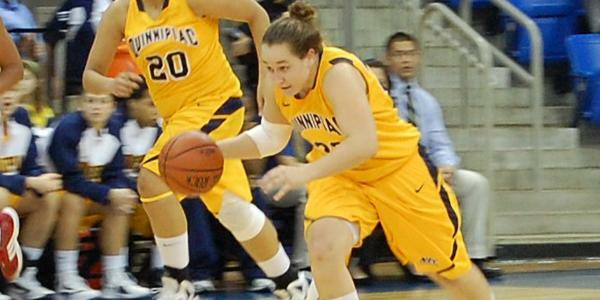 Quinnipiac’s five-game winning streak was snapped by Northeast Conference rival Sacred Heart University, 74-65, on Monday at TD Bank Sports Center. Felicia Barron had a team-high 19 points in the effort, shooting 7-for-15 from the field, and recording seven steals. Barron entered the game as the nation’s leader in steals per game with 6.1. Freshman Jasmine Martin tallied 14 points and eight rebounds and freshman Samantha Guastella added 10 points for the Bobcats (5-3, 1-1 NEC). The Bobcats struggled early with the Pioneers’ full court press, which forced the forwards to handle the ball instead of the guards. The Bobcats had 15 of their 26 turnovers in the first half. “We had everybody else, excluding our point guards throwing the ball around the gym for turnovers and a ton of travels,” Fabbri said. Brittany McQuain suffered an injury early on in the game limiting her time on the court and limiting her to four rebounds on the game and just two points. McQuain was averaging 10.7 rebounds per game before Monday’s matchup. Her two points are a season low. “We’re three weeks in, 5-3, and we are obviously disappointed for not getting to 2-0 (in the conference), but we’ve been able to make significant progress week to week, and I think we again are just going to get back to film on Wednesday,” Fabbri said. Sacred Heart (7-1, 2-0) capped off the last two minutes of the first half going on a 8-0 run, taking a 34-31 lead into the locker room to end the first half. Thirty of Sacred Heart’s 74 points came off of Bobcat turnovers. Callan Taylor led Sacred Heart with 26 points and nine rebounds. Ericka Norman had a double-double for the Pioneers, recording 10 steals and 11 assists. The Bobcats will travel to Kingston, R.I. Saturday to take on the University of Rhode Island at 2 p.m.